How to save videos from Instagram to iPhone? I want to be able to save a video on instagram that someone tagged me in, to my iphone so I can then share it on facebook. My cousin posted a video of my son on instagram and tagged me in it so its now in my instagram news feed. How, if possible, do I save Instagram video to my phone or somehow share it on facebook. I don't understand why they make it so difficult to do things like this on instagram. Any way I can do this? Actaully, there are various ways to download Instagram videos, via online services, Instagram video download software, or mobile app, all of which can be free. It's okay to download Instagram videos from keepvid.com, or sacefrom.com. But in view of the threat of virus, adware, confusing call-to-actions, professional Instagram video downloader and app that deliver great convenience and efficiency are highly recommended. How can you save Instagram videos free and 100% safe? MacX YouTube Downloader is the best answer to the question, not only because it is a totally free program nor it has no virus, adware, spyware, but also because the ability to get the task done easily and efficiently and it has other stunning features. It gives you easy access to download Instagram videos free to regardless of video format and resolution, be it MP4, MOV, AVI, FLV or 720P, 1080P, 4K etc. Within seconds, merely the blink of an eye, the Instagram video will be downloaded with this tool with original quality unchanged. Batch downloading is also supported. The Instagram video saver supports downloading HD 4K videos from over 300 sites, YouTube, Facebook, Vimeo, Dailymotion, Metacafe, Break, to name just a few. You can choose to automatically add downloaded MP4 Instagram videos to iTunes Library for transferring to iPhone, iPad etc. For your reference: the Instagram video downloader can deal with the task effortlessly, and its advanced version - MacX Video Converter Pro may be needed to help you convert Instagram videos movies to MP4 MOV AVI MKV, etc. Apple Android devices to acceptable format, or compress, edit and convert video to Instagram friendly video file size and formats. Did I mention it can make photo slideshow for uploading to Instagram and capture photos from Instagram? Step 1: Download free Instagram video downloader and run it. Open the video you are going to download on Instagram, copy and paste the video URL to the box frame. Click "analyze" to load Instagram video details. Step 2: Choose the video format you want to download, like MP4, FLV, and video resolution, file size. Step 3: Hit "Browse" button to select an output folder to save downloaded Instagram videos. Step 4: Click "Download Now" button to start the download of Instagram videos in HD, 4K UHD, 720P etc. It also lets you download Vimeo videos, YouTube videos, FB clips, and more. P.s. You can also download Instagram videos on Windows operating system only if downloading Windows edition Instagram downloader and following the same steps above. Any apps to download videos from instagram? I've tried a few apps and every time I download a video the sound is perfect. Once it's uploaded to instagram the voices get all distorted. I have a galaxy s4. 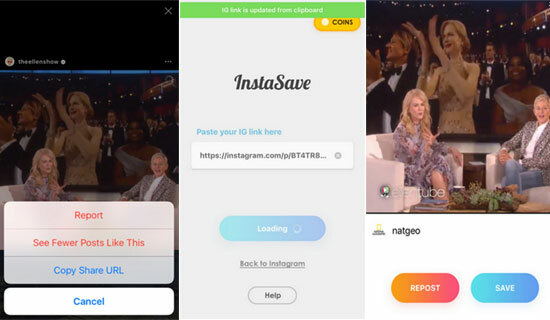 A wide range of apps to copy a video from Instagram have hit the market. I've rounded up top apps here that receive more positive reviews. Before you try, it is significant to note that Instagram videos download apps lose the ground to professional software in performance and stability. It's at your discretion which one to use. Featuring ease of use, it requires no register and saves videos and pic from Instagram in only three steps, click "Copy Share URL", get back to the app and press the text field, click "paste", click "download". Great but... It started out pretty good... I loved it! But lately it has been saying Error... please fix. Its a really good app. This app is amazing. I just wish that the video would save to my phone and not the app. Common complaints received from users are that error occurs occasionally and downloaded Instagram video can only be saved on the app instead of mobile devices, the latter is a typical issue for Instagram video download apps. InstaSave is simple to use, needless of register. It is able to download Instagram video and photo directly to your phone. All you need to do is to copy and paste video URL. It receives average 4.3 starts out of 5 stars. But it is the pro version of InstaSave that gives you opportunity to save Instagram video, the free one only downloads photos from Instagram. Ads seem to be the most pesky part of the this Instagram video downloader app, it is good but can be improved. Good I'd give it a 5 if the ads weren't too crazy . but it does the job. What are Instagram video formats for uploading? Here's a list of best video format for Instagram, Instagram video full specifications and how to change video to the best format for Instagram. 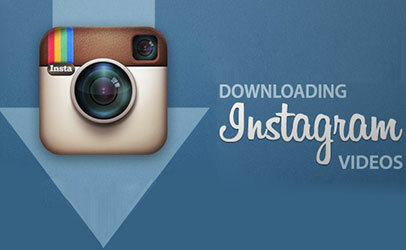 In this article, all feasible tips will be given to fix Instagram not working error. Follow the guide and solve all Instagram problems like video not playing, Instagram crashing, couldn't refresh feed, no sound on Instagram video. You probably gets many options to edit videos for Instagram uploading. But you can find the best answer to make killer Instagram videos here, where top ways and Instagram video editor apps are shared in details. 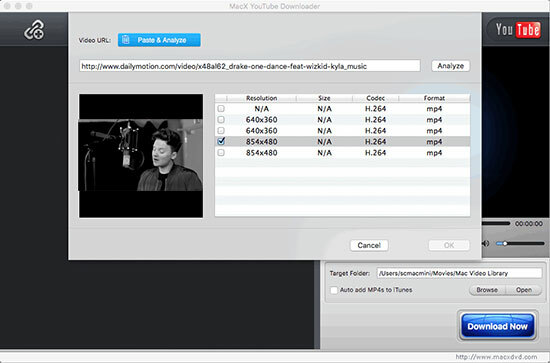 MacX YouTube Downloader is an all-around downloader with high quality and incredibly fast speed. It provides superfast solution to download Vimeo HD videos.